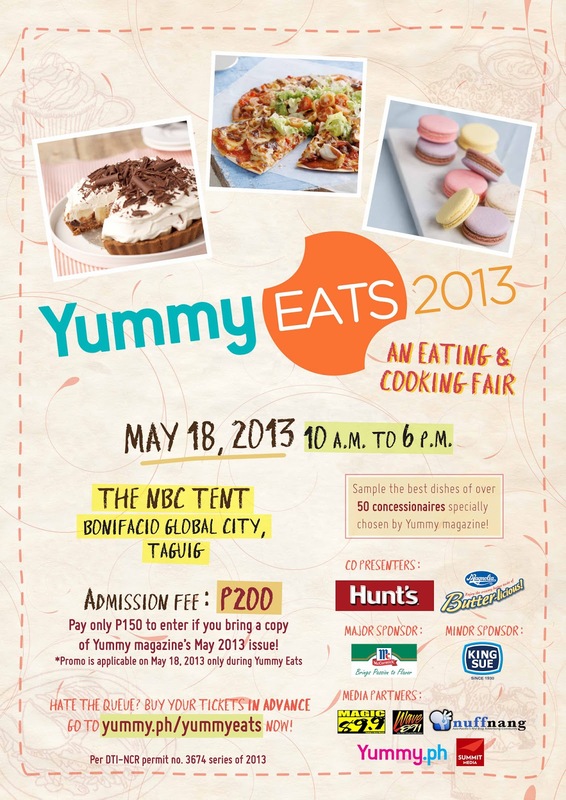 The Food Alphabet and More: Yummy Eats 2013 - It's a date! Admission to YUMMY Eats is only P200. You can also bring your May issue of YUMMY magazine for a discounted entrance fee of P 150! Can't wait to get those tickets! then go on and reserve your tickets by reserving and paying online via http://www.yummy.ph/yummyeats starting May 3, Wednesday! YUMMY magazine is available in newsstands, bookstores, and supermarkets nationwide for only P 125. Be part of YUMMY’s growing online community by visiting http://www.yummy.ph; liking us on Facebook via http://www.facebook.com/yummymagazine; and following us on Twitter viahttp://www.twitter.com/yummyph.